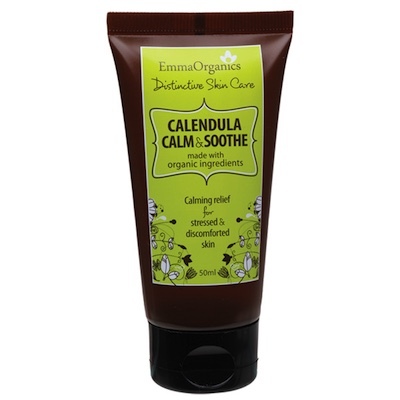 Emma Organics CALENDULA CALM AND SOOTHE is a calming cream formulated to soothe and repair stressed and discomforted skin. Organic Calendula extract and oil - known for its ability to sooth itchiness, whilst delivering calming and repairing actions. Organic Shea Butter & Avocado and Coconut oils - hydrate, restore and prevent moisture loss. INGREDIENTS: Purified Water (Aqua), Organic Aloe Vera (Aloe Barbadensis) Juice, Cetearyl Olivate, Sorbitan Olivate, Organic Shea (Butyrospermum parkii) Butter, Organic Safflower (Carthamus tinctorius) Oil, Calendula (Calendula officinalis) Infused Oil, Organic Coconut (Cocos Nucifera) Oil, Organic Rosehip (Rosa canina) Oil, Carrot (Daucus carota sativa) Oil, Organic Glycerin, Organic Avocado (Pesea gratissima) Oil, Organic Papaya (Carica papaya) Extract, Clove Bud (Eugenia caroyphyllus) Essential Oil, Xanthan Gum, Parfum, Organic Lavender (Lavandula angustifolia) Essential Oil, Organic Arnica (Arnica montana) Infused Oil, Potassium Sorbate, Organic Calendula (Calendula officinalis) Extract, Natural Vitamin E (Tocopherol), Citric Acid, Organic Chamomile (Chamomillia recutita) Essential Oil, Organic Tea Tree (Melaleuca alternifolia) Essential Oil, Kakadu Plum (Terminalia ferdinandiana) Extract.